Shown to our table by a smiling hostess, we were impressed to see that we had been given one of the booth-style tables on the upper floor of the venue before being handed our menus and told that our server would be with us shortly. True to her word, a very friendly young waiter soon appeared to take our drinks order, and left us to peruse the menu. The a la carte menu at The Living Room is quite a mix: Mediterranean-influenced dishes sit alongside more Oriental flavours, as well as British classics such as fish and chips and beef & ale pie. There’s also a fixed price menu for those dining between 12 and 6pm, Monday to Friday, and Sunday lunches are also available – 2 courses for £11.25, or 3 for £13.75. Our selections came from the a la carte menu…and took a while, as there’s quite a lot of choice! Our waiter made us smile…while taking our order, he was keen to upsell as much as possible. While this could have been irritating, he did so in a light and jokey tone that was endearing rather than alienating. Great customer service. 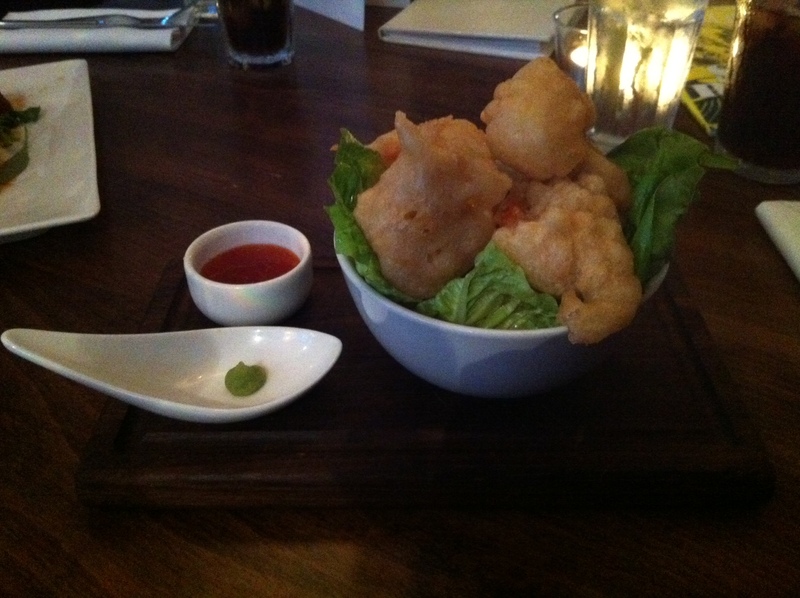 First up for me, the beer battered tiger prawns with sweet chilli and wasabi (£6.95). A very generous portion: six large prawns in the lightest of batter, with a beautiful flavour and not a hint of grease. It was lovely also to have two different levels of heat to accompany the prawns – a definite improvement on our previous visits already. 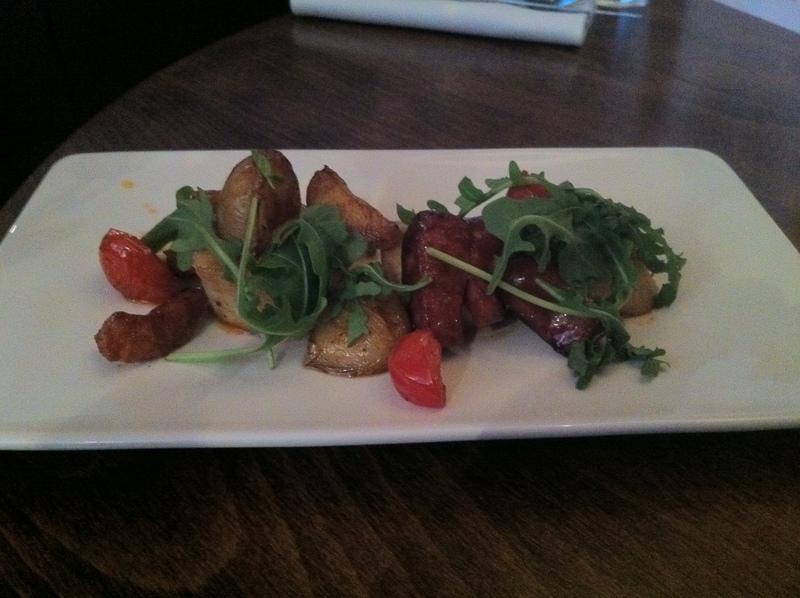 For my friend, the pan seared scallops with chorizo, new potatoes and baby plum tomatoes (£8.25). The scallops themselves were fresh, fat and juicy, the chorizo beautifully cooked, but she said that she would have enjoyed the dish even more if it had a bit of chilli heat included. 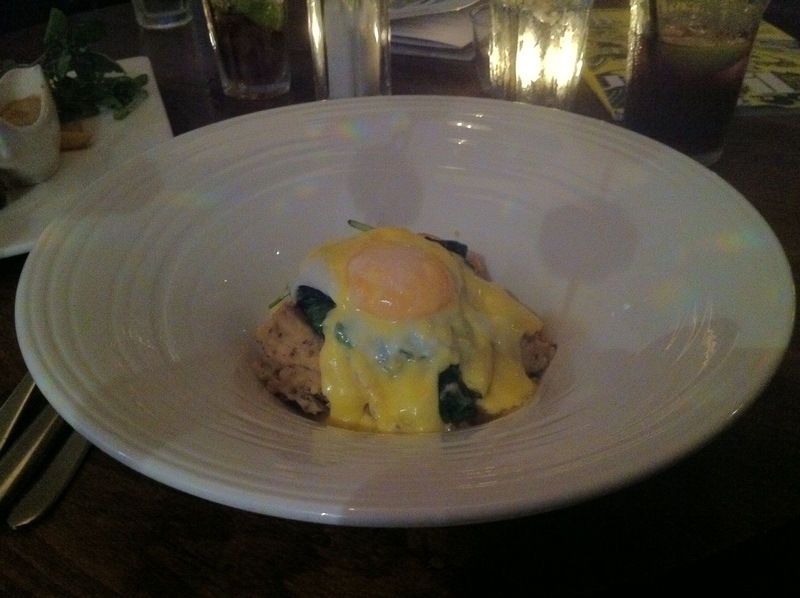 It was the smoked haddock with wholegrain mustard mash, wilted spinach and Hollandaise topped with a poached egg (£12.45) that stood out for me from the main course menu. It was good to hear our waiter asking, on ordering, whether or not I wanted my egg soft poached…and the answer was an unhesitant yes. True to his word, the egg yolk was lovely and runny, the fish was cooked perfectly and flaked easily under my fork, and the tang of both the Hollandaise and the wholegrain mustard mash were lovely. The spinach got a little lost amongst all of the other flavours, but no complaints. My dining partner ordered the 21-day aged fillet steak (£21.75), served with a flat mushroom, grilled tomato and chips, and opted for a peppercorn sauce (£1.75) with which to accompany it. 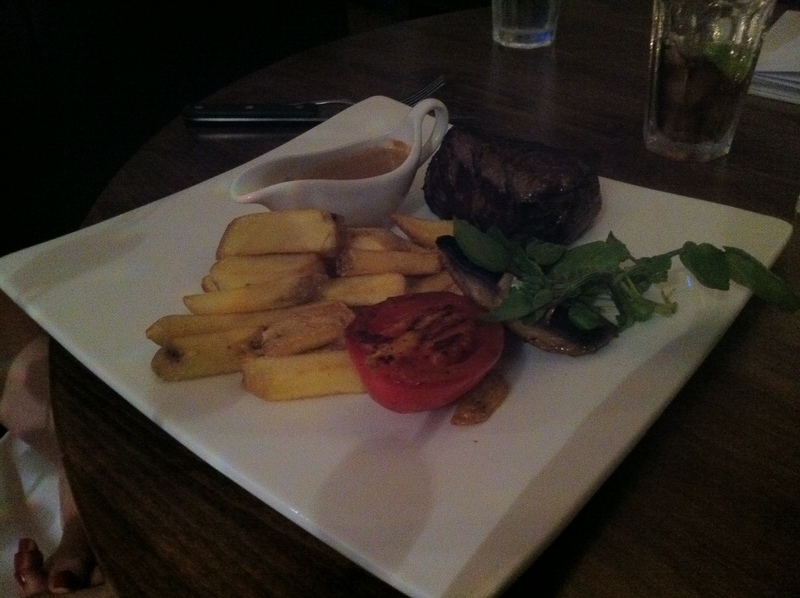 The chips were cooked complete with skins, which always appeals, and the steak cooked just as she had requested. We somehow found the space to force down desserts: for me, the rhubarb compote and blackberries with a sabayon cream (£4.95). The rhubarb was well cooked, not over-stewed and still had some texture, and was on just the right side of tart. 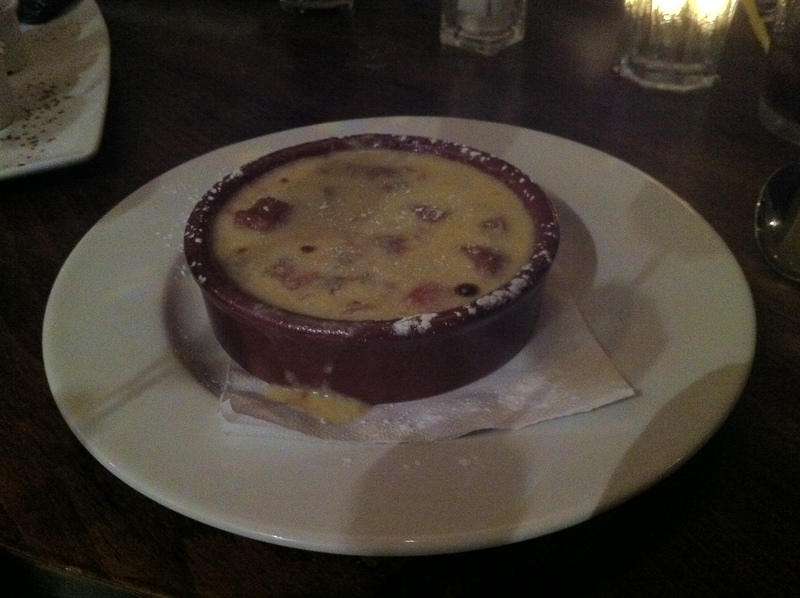 While tasty enough, the sabayon had a hint of flour flavour to it, which was a little odd. 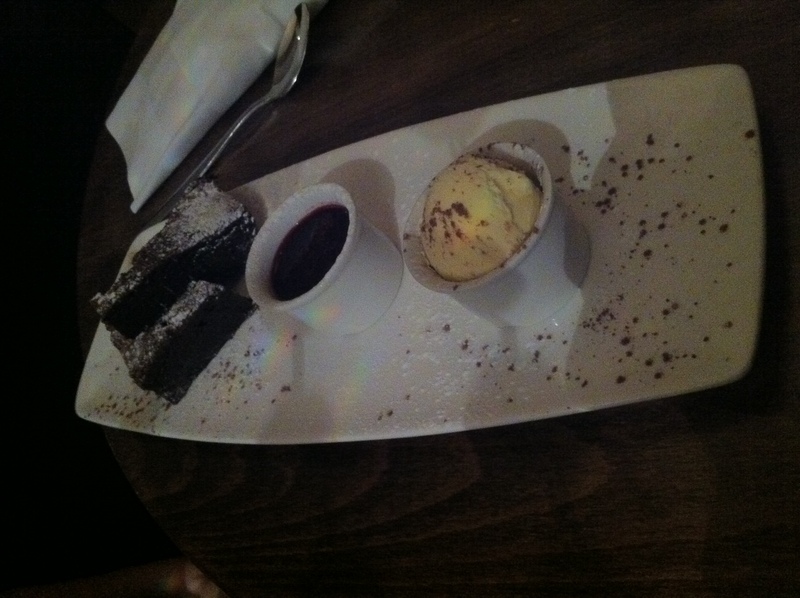 Nothing but praise, however, for the chocolate brownie with raspberry compote and Cornish dairy vanilla ice cream (also £4.95) ordered by my friend – two dense and fantastically moist triangles of brownie, with a scoop of ice cream and a helping of raspberry compote served in their own individual ramekins. A definite plus point in her book, as she could taste the individual components separately as well as combining them. NB: This meal was complimentary (we paid for drinks) at the request of The Living Room for a review. The provision of a letter entitling us to a three course meal, which we showed at the end of the evening (plus booking in my friend’s name rather than mine), meant that they were not aware that the meal was being reviewed while we were there. April 2012 my husband and i celebrated our 25th wedding anniversary with 87 of our famly and friends. The staff were amazing, could not do enough to make all our guests happy. The food was outstanding and so tasty. Everyone without exception had a brilliant evening. Needless to say we had a great night. Something for everyone. The piano player set the atmospher and played great up to date songs and request. Would recomend this in a heart beat. So many of our guests had no idea this place was here, but just loved everything about it.